The World’s Greatest Sneaker is Mark Covert’s Moon Shoe. 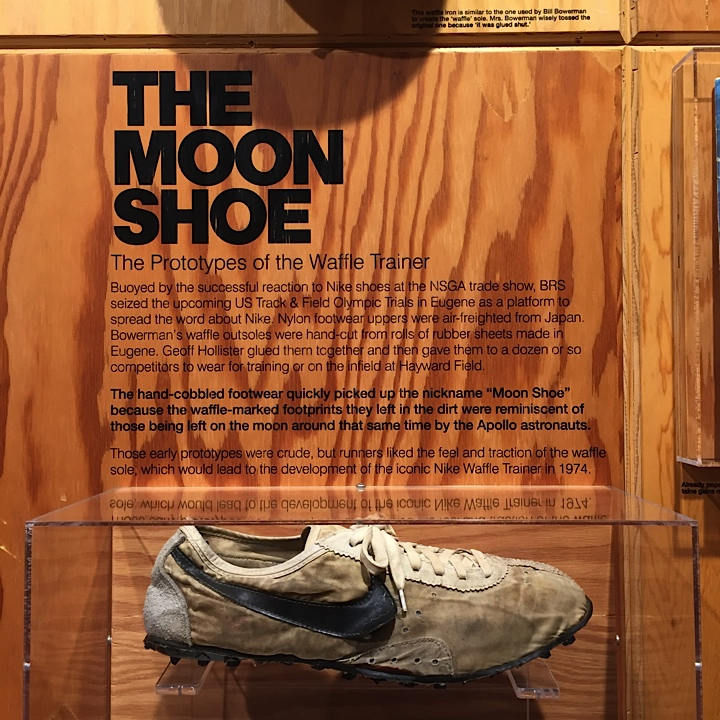 Nike’s first innovation was the Waffle Sole and Mark’s Moon Shoe was the first Nike Waffle to ever cross a finish line. He did this at the 1972 Olympic Trials in the Marathon. Mark’s time was 2 hours and 23 minutes. He finished the race in 7th place. 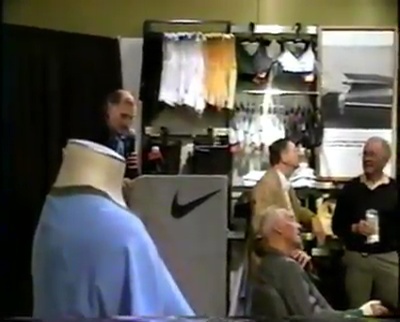 The shoes were handmade by Geoff Hollister under the direction of Bill Bowerman. Only ten pairs were made. Five athletes wore them. Mark was the first one to cross the finish line and successfully complete the race. The sole is in two pieces. The rubber was hand cut and the shoes were hand cobbled. Notice the rubber that was cut with shears. The soles were glued and stitched. And they have Spenco insoles to prevent the stitching from irritating the athletes’ feet. The swooshes were sewn with fish line. Only one swoosh is completely in tact. It’s the lateral swoosh on the left shoe. There is no Nike logo on the tongue. There are no midsoles on the shoes (just Waffle Outsoles and Nylon Uppers) so the shoes will not deteriorate and crumble. The white uppers are made of Nylon and were flown in from Japan. The holes in the upper were hand punched by Geoff Hollister for breathability. Notice the perfect laces and aglets (lace tips). The shoes were made in Eugene at Jim The Shoe Doctor. 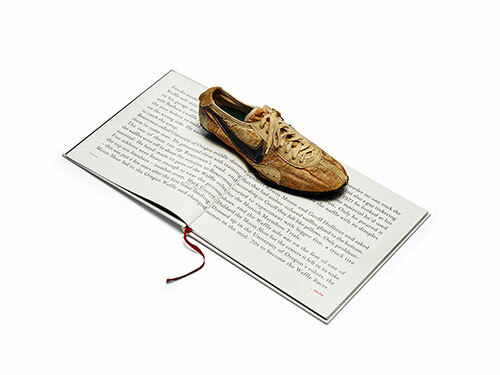 This is the Nike Bible. The Moon Shoe is featured on Page 1. There can only be one shoe on page 1. The Moon Shoe is also known as the Waffle Racer. The Moon Shoe is “Innovation Zero” on the Nike Timeline. 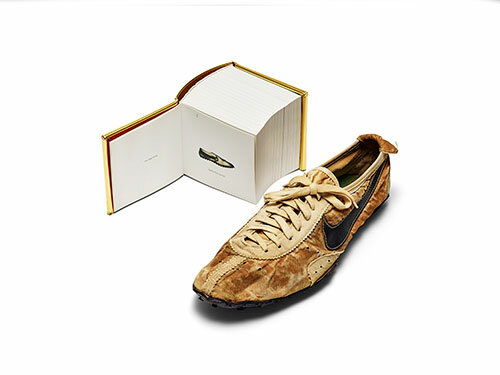 This book features the most progressive Moon Shoe alongside Steve Prefontaine. 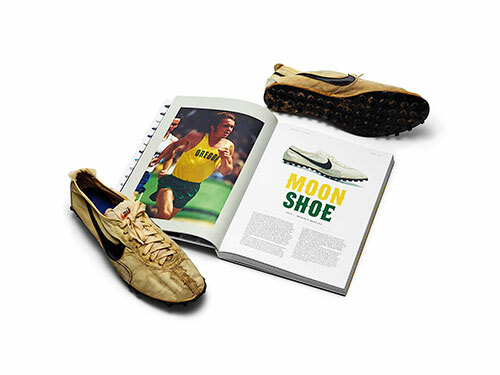 The Moon Shoe is enshrined in Prefontaine Hall at Nike World Headquarters.